Today, at 33 years old and with a master’s in economics from Université de Montréal, Ms. Berechid is a Canadian citizen and holds a position with the City of Montreal. If it were up to the Quebec government, stories like Ms. Berechid’s would increase exponentially. Quebec’s population is the fifth oldest in Canada, outdone in seniority only by the four Atlantic provinces. In 2015-16, its population grew only 0.8 percent – below the national average for the fifth year in a row, according to Statistics Canada. In October 2016, the Quebec government invested $1.6 million over the course of three years in MI’s “I choose Montréal” program, aimed at tripling the number of international students who stay in the region after graduation. A similar mandate was given to Québec International in March 2017 for Quebec City and the Chaudière-Appalaches region south of the city. The Quebec government followed that up in May with an $85,000-grant to Sherbrooke Innopole to entice international students to study in the Eastern Townships region and to remain there following their studies. A recent study by the Institut du Québec, carried out in partnership with the Conference Board of Canada and HEC Montréal, highlights three obstacles the province must overcome to claim success in retaining international students. Learning the French language – a requirement for permanent residency – is the first major difficulty for non-francophone students. The Quebec government is keenly aware of this issue and now offers students and residents free French language training online, a service that was previously reserved for approved immigrants. The first step in keeping more foreign students in Quebec would be to attract more of them. The number of international students enrolled in Quebec universities increased by 72.7 percent in Quebec from 2004-05 to 2014-15, whereas it jumped 102 percent in Ontario and 207 percent in British Columbia, according to StatsCan. Quebec lags behind other provinces partly because French-language universities in Quebec recruit mainly from francophone countries, while English-language institutions benefit from a massive intake of Asian students, particularly from China and India. In 2016, close to 60 percent of international students at Université de Montréal came from France, compared to 4.2 percent from China. At McGill University, approximately 18 percent come from China and 16 percent from France. 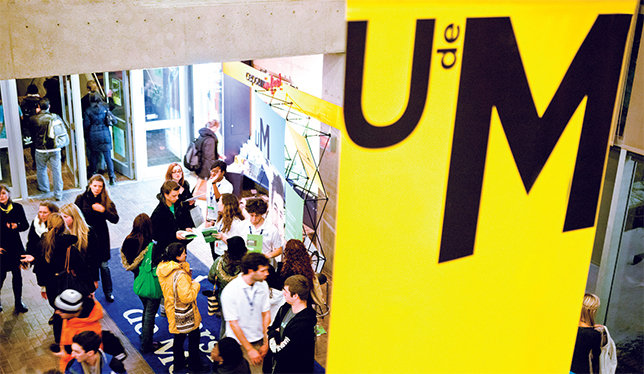 Prospective students attend an open house event at Université de Montréal. Photo by Université de Montréal. Guy Lefebvre, vice-rector, international affairs and la Francophonie at Université de Montréal, admits that his university is seeking to diversify the countries that students come from. He particularly has Brazil, China and Peru in his sights. These efforts seem to be bearing fruit as the rankings company Quacquarelli Symonds recently named Montreal the best city in the world for international students for 2017, overtaking Paris, which had held the top spot for the previous five years.